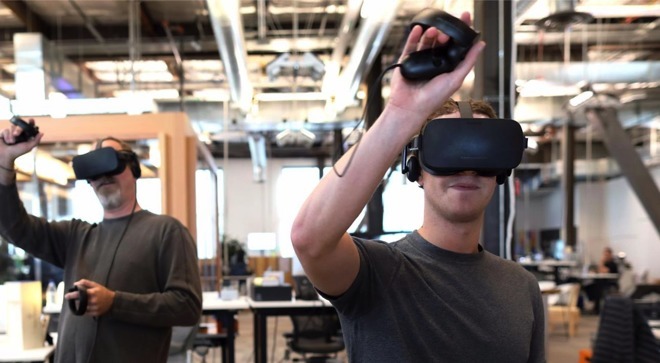 Facebook has unveiled the next steps in the Oculus virtual reality platform, including a sneak peek at a wireless version of the Oculus Rift, and an initiative to lower the hardware requirements needed to use the system to specs already exceeded by Apple's 4K and 5K Retina iMac lines. Citing a "slow start" in 2016 for Facebook's Oculus program, CEO Mark Zuckerberg took the stage today to discuss the long-term social future of the platform, and what's in store in the next few months. Claiming that the current hardware is sufficient for great experiences, most of the announcements on Thursday were on the software and peripheral side of things. As expected, Facebook wants to add social experiences to the Oculus Rift. Demoed on Thursday were VR avatars for players, with exaggerated, cartoony facial expressions, currently missing from social VR experiences. The environment was explored using Oculus' $200 Touch controller, announced today. 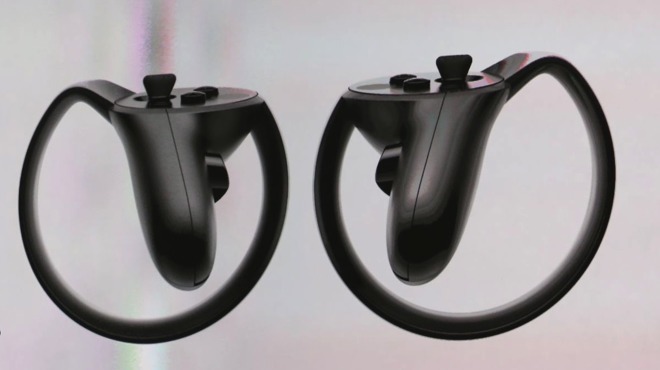 No dramatic changes have been made to the exterior of the controller since it was first revealed, and functionality and tracking resolution remains the same, according to Facebook. Zuckerberg briefly touched on a demo product of the consumer Oculus Rift, that wasn't tethered to a gaming computer. While not on stage for the keynote, Zuckerberg claims that a roaming version of VR, where a user can wander around a space and be tracked by a software and hardware combination is where the future lies for the technology. "We all know where we want to improve and where we want virtual reality to eventually get —It's this feeling of real presence," said Zuckerberg. "We want hardware that's a lighter form factor and smaller, that can do both VR and AR, that can do eye tracing and mouth tracking and hand tracking." The Unreal Engine is the main developer's tool for developing for the Oculus Rift. The software is free, but Epic claims a portion of revenues generated from titles made with the environment. A fund newly started by Oculus will cover license fees for the Unreal Engine. Oculus will pay fees for up to the first $5 million in gross revenue, in an attempt to kickstart development for the platform. The Rift SDK will see an update soon, implementing a feature called "aschyncronous timewarp." The feature, intended to fill in gaps for lost frames so the user does not become ill, "kicks in, grabs the previous frame and the most recent head orientation, and warps it into place," allowing for the app to catch up and not render the missed frames. Asynchronous timewarp, and other engine efficiency improvements, allows for lower frame rates to simulate a "mandatory" 90 FPS experience. As a result, the minimum specifications for a VR system have been lowered to an Intel i3-6100 processor, 8GB of RAM, HDMI video, three USB ports, coupled with a Nvidia 960 or greater GPU. macOS support was not announced at the event on Thursday, but the existing crop of high-end 4k and 5k Retina iMacs now fit the bill for compatibility. Oculus has previously stated that it would build the SDK for macOS when the Apple-build hardware could support the platform. Another attempt to launch development is the "Carmel" VR browser. Oculus will tune it to run on "any VR device" and it will shift web browsing to a more VR-friendly format, with virtual spaces, and other niceties. The Carmel browser utilizes the avatars that Zuckerberg had demonstrated earlier in the presentation, giving users a persistent identity anywhere on the Oculus Rift platform. Oculus touched on improvements to the mobile SDK. Coming to the smartphone-oriented version of the VR toolset, Oculus is adding a remote monitor to aid in developer performance improvements in titles, as well as a video SDK to allow for streaming. Oculus is pledging $50 million in 2016 to boost mobile VR game development. Along with all the other announcements, Oculus has also released new earphones for $50 which the company promises sound quality "as good as a $900 pair of headphones." For room-scale roaming VR, a $80 third sensor is available as well. While Apple had utterly no presence, or mentions in Thursday's reveal event, the company has hinted several times that augmented reality, and virtual reality technologies were being examined in-depth as potential future areas of entry. Earlier this month, Zeyu Li, a former Magic Leap employee joined Apple as a Senior Computer Vision Algorithm Engineer. Yury Petrov, who worked as a research scientist at Facebook's Oculus since 2013, took an identical position at Apple in June. From patents for AR devices with transparent displays to iPhone-powered VR headsets, evidence of Apple's interest in the space is mounting. During a quarterly investor conference call in January, CEO Tim Cook responded to a question about Apple's potential role in the future of VR, saying he thinks the technology is "cool" and has interesting applications. Cook expanded on those thoughts six months later during Apple's most recent earnings call, confirming investments in AR technology, adding that the potential for growth is "huge." Cook mentioned Apple's ongoing development of AR solutions in an interview in August, and did again speaking with ABC News' Robin Roberts in mid-September. Asked about the prospect of Apple-branded virtual and augmented reality products, Cook said that while VR promises "cool" applications for gaming and education, AR technology is of particular interest. "There's virtual reality and there's augmented reality —both of these are incredibly interesting," Cook said to Roberts. "But my own view is that augmented reality is the larger of the two, probably by far."